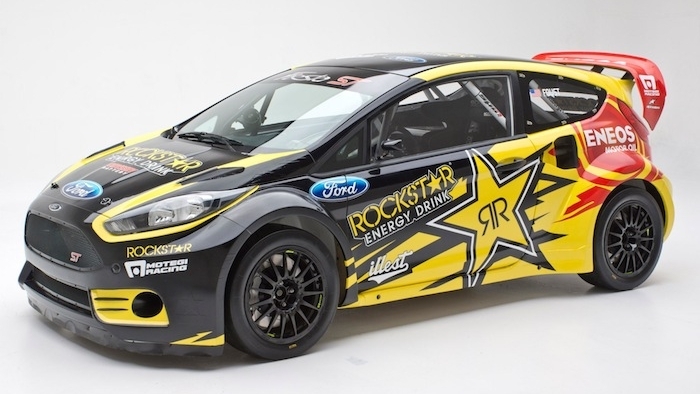 Tanner Foust officially unveiled the 2013 Rockstar Energy Drink Ford Fiesta ST rallycross car for his fans during a sneak preview at Bristol Motor Speedway this past weekend. "Our focus for 2013 is pure rallycross, with X Games, the Global RallyCross Championship and the European Rallycross Championship on the calendar," said Foust. The driver will compete in an expanded X Games schedule that adds three international stops to the traditional summer event in Los Angeles. The first rallycross competition in the marquee, invitation-only action sport contest takes place April 21 in Foz do Iguaçu, Brazil, followed by rounds in Spain in May and Germany in June. X Games Rallycross returns to Los Angeles in August. But Foust's 2013 competition season opener is less than two weeks away. He travels to the Lydden Hill Race Circuit, in southeast England, for the first round of this year's European Rallycross Championship, March 31 and April 1. Foust is expected to take part in select rounds of the European Rallycross Championship in 2013. For more on Tanner's 2013 schedule go to http://www.tannerfoust.com.